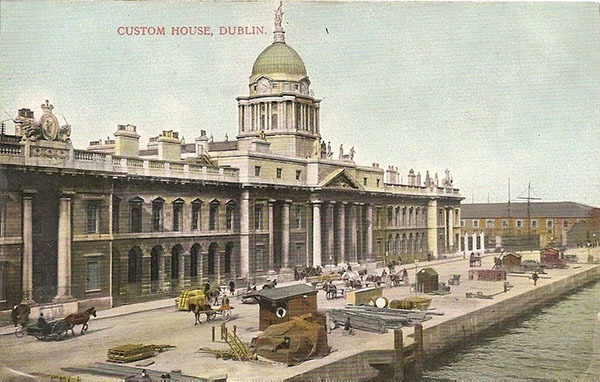 The Custom House is often considered architecturally the most important building in Dublin and is sited on the river front with Beresford Place to the rear. 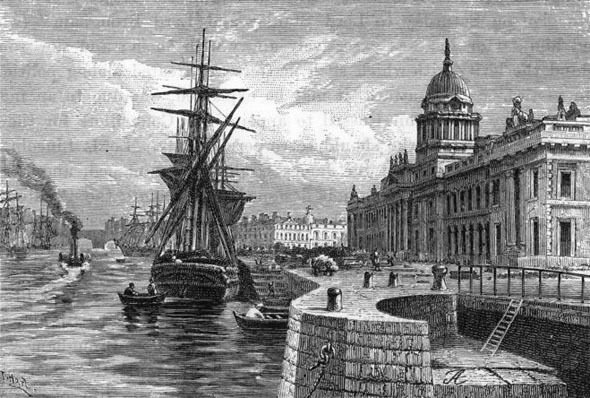 The Custom House was the first major public building built in Dublin as an isolated structure with four monumental façades. The previous Custom House by Thomas Burgh and built in 1707 was sited up river at Essex Quay and was judged as unsafe just seventy years later. The site chosen for the new Custom House met with much opposition from city merchants who feared that its move down river would lessen the value of their properties while making the property owners to the east wealthier. The decision to built further down river was forced by the Rt. Hon. John Beresford (1738-1805) who was appointed Chief Commissioner from 1780 onwards and was instrumental in bringing James Gandon to Ireland. 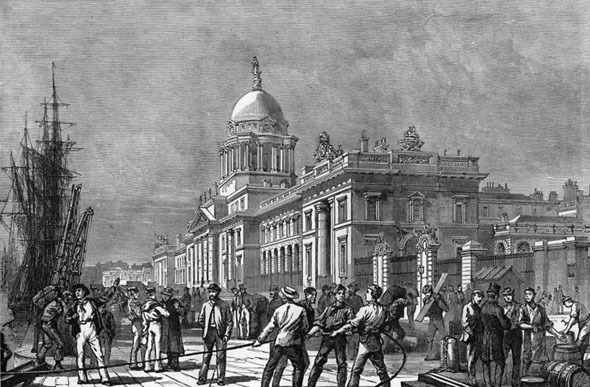 He favoured shifting the city centre eastwards from the Capel – Parliament Street axis towards a new axis on College Green with Drogheda Street and the construction of a new bridge linking the two sides. The building was built on slob land reclaimed from the estuary of the Liffey when the Wide Streets Commissioners constructed the Quays. The line of the crescent Beresford Place that surrounds the Custom House follows roughly the line of the old North Strand along the estuary before the construction of the Quays. 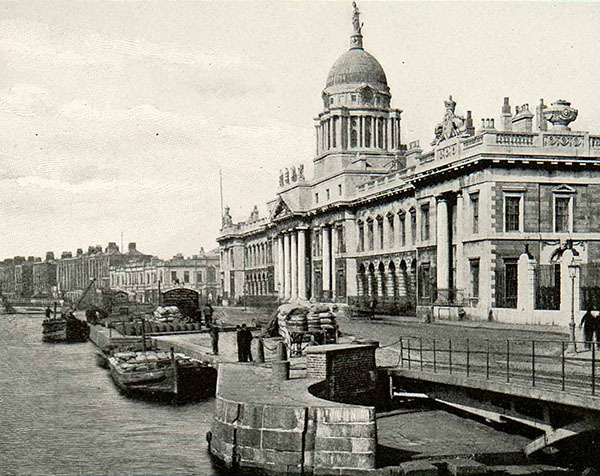 Started in 1781, the new Custom House was finished ten years later at a cost of over £200,000. The finished external design consisted of four façades each different but consistent and linked by corner pavilions. The exterior of the building is richly adorned with sculptures and coats-of-arms by Thomas Banks, Agnostino Carlini and Edward Smyth who carved a series of sculpted keystones symbolising the rivers of Ireland. 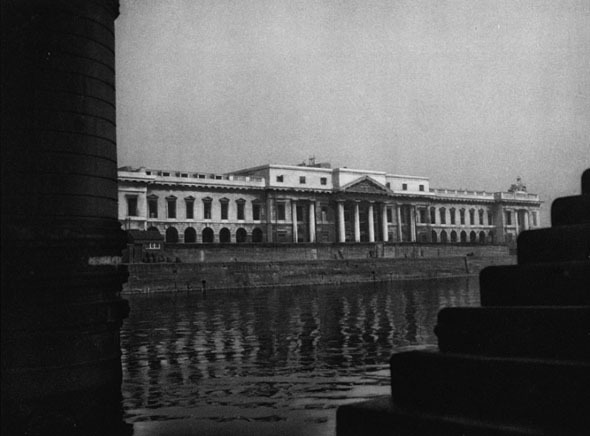 Described by Lewis in 1837, “The Custom-house is a stately structure of the Doric order, situated on the north bank of the Liffey, below Carlisle bridge. It was erected under the superintendence of Mr. Gandon, in 1794, at an expense of £397,232. 4. 11., which the requisite furniture and subsequent enlargements have increased to upwards of half a million sterling. The building is 375 feet in length and 205 feet in depth, and has four fronts, of which the south is entirely of Portland stone, and the others of mountain granite. 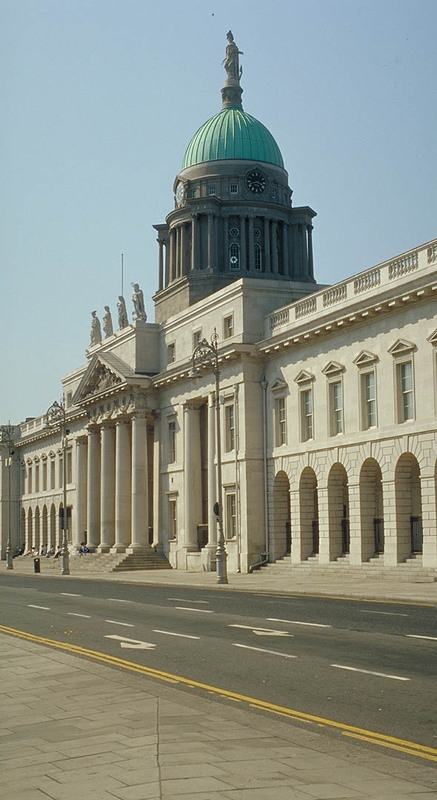 In the Irish Civil War of 1921-1922 the interior of the Custom House was destroyed when the building was completely engulfed by fire lit by the IRA. The fire blazed for five days, destroying a huge quantity of public records. The heat was so intense that the dome melted and the stonework was still cracking because of cooling five months later and Gandon’s interior was completely destroyed. 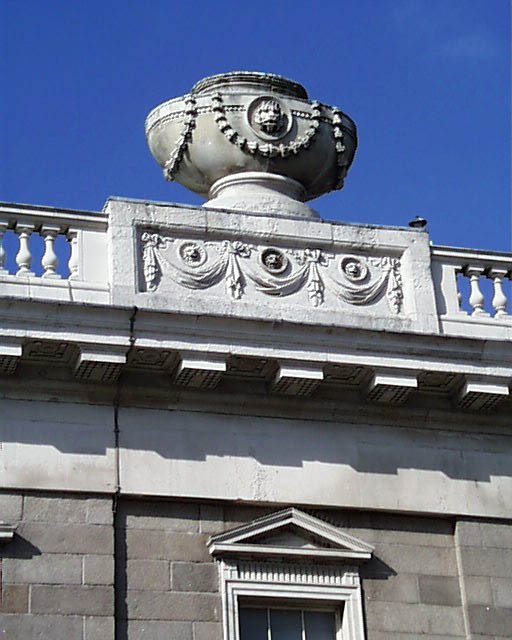 The building underwent serious reconstruction and the dome and drum were completely rebuilt in Ardbraccan limestone as opposed to the original Portland stone. The limestone is a much darker colour and this can be seen in the illustrations. The building was further restored by the Office of Public Works in the 1980s after it was discovered that the large cornice was in danger of collapsing from the damage caused by the fire and the rusting of the ironwork braces holding the stonework together. 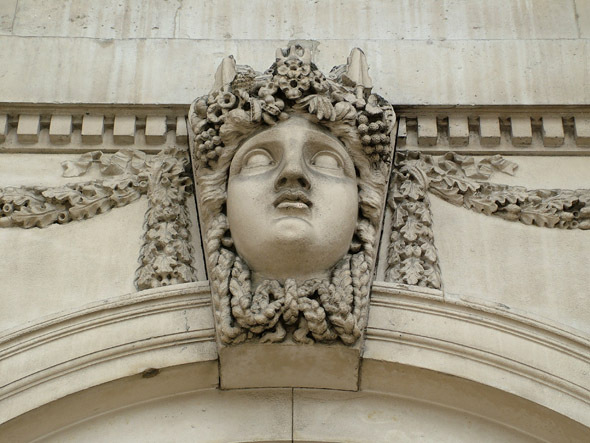 The fine sculptures and coats-of-arms that adorn the building were restored and a new Portland Stone cornice fitted to replace the sub standard one fitted after the fire. The finished external design consisted of four façades each subtlety different but consistent and linked by identical corner pavilions. 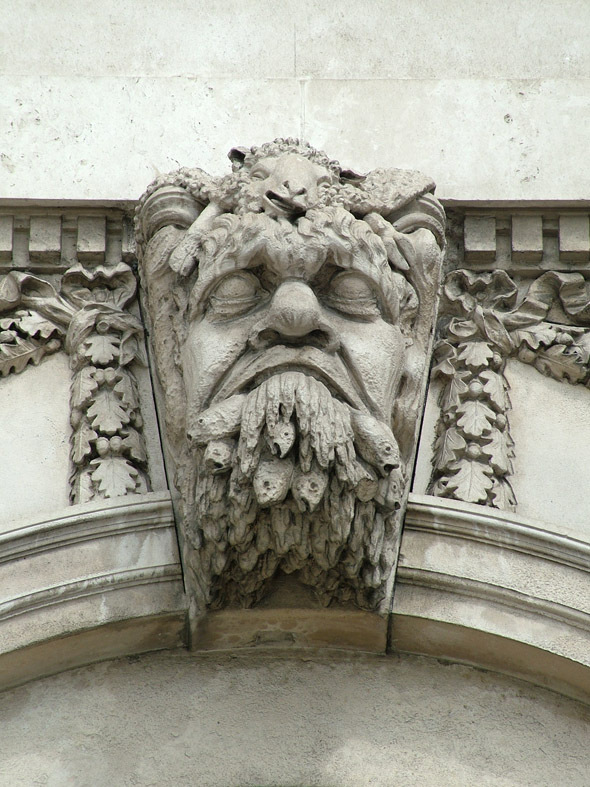 The exterior of the building is richly adorned with sculptures and coats-of-arms by Thomas Banks, Agnostino Carlini and Edward Smyth who carved a series of sculpted keystones symbolising the rivers of Ireland. 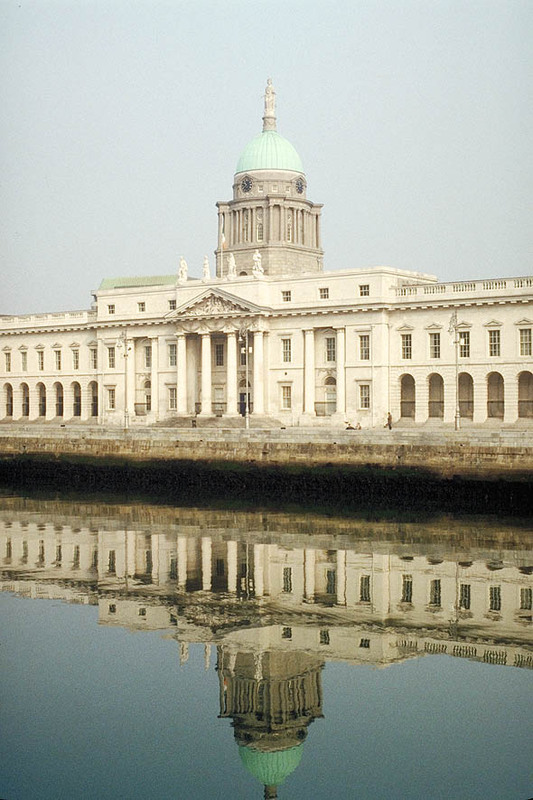 The main façade is typical of James Gandon’s façade treatment with an interplay between projections of block with the two end pavilions projected clear of the arcaded sections. Originally the windows on the first floor alternated between windows and blind niches but this was changed during the reconstruction following the fire. The central block is based on the design of the pavilions with a pavilion façade each side of the entrance portico. 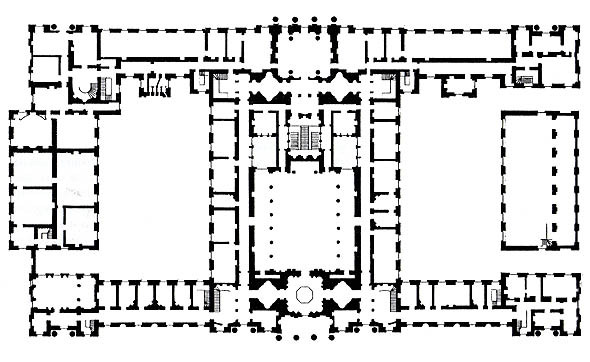 In the plan above which shows the building as originally constructed, there were two courtyards either side of a great hall. This hall destroyed in the fire was never rebuilt and a single storey block replaced it. Visually this is invisible from outside but from above and internally, the original intent is lost. Originally the eastern block was a bonded warehouse and was framed by two portals into the courtyard. The entrance into the Great Hall was processional through the entrance hall which opens up into the centre of the dome. To either side are two smaller domed chambers connecting to side corridors. The eastern side was enclosed in the 19th century as a dining hall. Originally this was a bonded warehouse with entrance portals through to the eastern courtyard at each end. The northern façade is place on an axis with Gardiner Street – ending the magnificent vista from Mountjoy Square. This façade is visually more horizontal than the main façade as it lacks the vertical emphasis of the drum and dome. 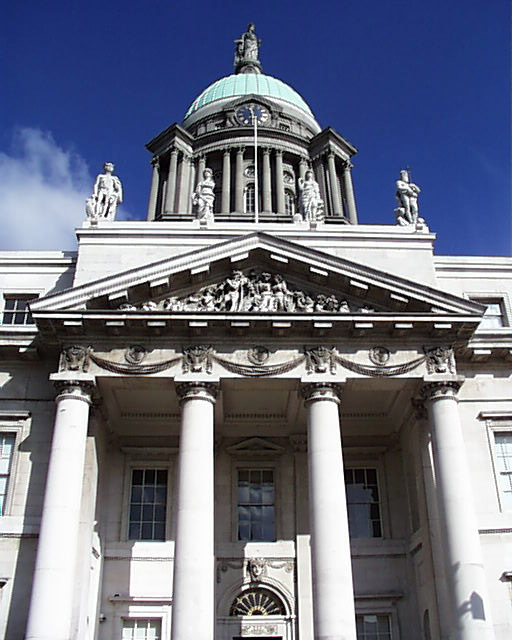 The exterior of the Custom House is richly adorned with sculptures, carved keystones and coats-of-arms by Thomas Banks, Agnostino Carlini and Edward Smyth. There is a strong Irish theme to the sculpture with the Irish rivers being symbolised and Hibernia in the main pediment sculpture. Bearing in mind that that there was an Irish Parliament at this time – the building is a demonstration of the aspirations of the Irishmen who were responsible for running the country at this time. On the main pediment, Hibernia is seen embracing Britannia while Neptune drives away famine and despair. Above the pediment stand four more figures symbolising Neptune, Mercury, Industry and Plenty. Atop the dome stands a large figure of Commerce. 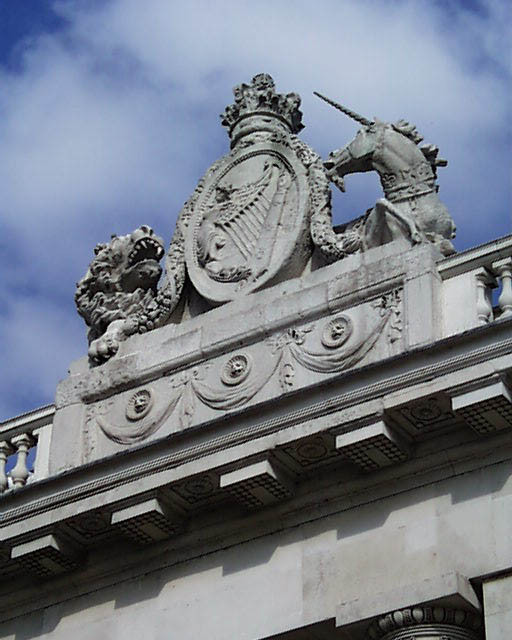 Unusually as might be expected on a crown property the roof line coats of arms are not that of King George III but of the Kingdom of Ireland with a Lion and a Unicorn either side of the Irish Harp. 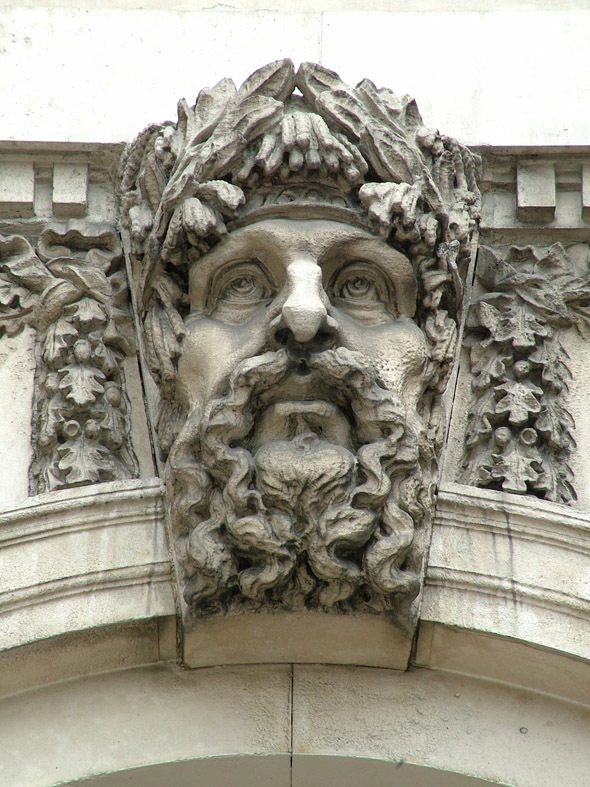 On the north face at Beresford Place are personifications of the four continents of world trade – Africa, America, Asia, and Europe. This mirrors the four statues on the south façade. 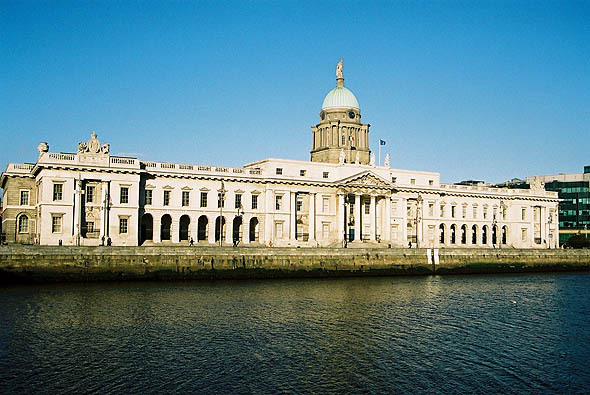 The sculptures that most associate with the Custom House are the keystones of riverine heads personifying the Atlantic, and the rivers Bann, Barrow, Blackwater, Boyne, Erne, Foyle, Lagan, Lee, Liffey, Nore, Shannon, Slaney and the Suir. The heads of the rivers are laden with the fruits of their basins.